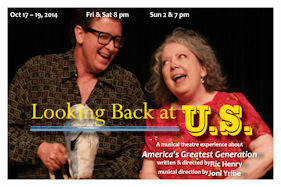 This lively musical revue tells the story of America's Greatest Generation through the tunes, TV theme songs, advertising jingles and other melodies of their youth. The show is written and directed by Ric Henry, with musical direction by Joni Yribe, and features Joel Gossett, Vicki Hamilton, Ric Henry, Joanne Roshon, Mirands Colvin, Brooke Eyler, Samantha Gault, and Lynda Schmidt. Instrumental music is provided by Adrienne Nims on saxophone, flute, piccolo and clarinet. The producer is Annette Alliano.